An organised firework display will return to Sherdley Park this Bonfire Night, with organisers promising it to be one of the biggest and best displays yet. 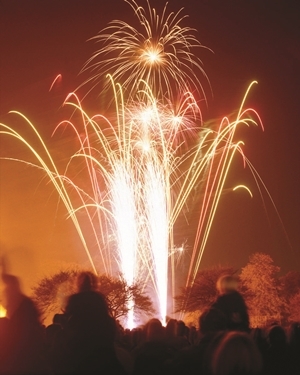 Thousands of visitors are expected to attend this year’s event which will see fireworks launched in rhythm with popular music tracks at a children’s display, before the event closes with a main spectacle. Suzanne Davies, St Helens Council’s Events Officer said: “This year we will be hosting a musical fireworks display which we believe will be hugely popular and attract a large audience from across the region. Secure, chargeable, stewarded and fully lit car parking is available at Mere Grange (£5 per car), Lea Green Station, Sutton Academy and The Islamic Centre (£10 per car) or you can park for free at nearby Chester Lane Centre. Hot food and drinks will be available from a number of stalls on the night to keep everyone warm. Event-goers are asked to leave their sparklers at home this year. Spent sparklers that can be missed during the clear up operation can cause serious injuries to those taking part in sports activities and dogs being walked in the park after the event. The event gets underway at 6pm on Sunday 5 November, with the opening of the funfair (open until 9pm) followed by the children’s fireworks display at 7pm. The main event will get underway at 8pm.